A significant milestone has been achieved with the signing of the Future Submarine Program Strategic Partnering Agreement (SPA) by the Commonwealth of Australia (CoA) and Naval Group. The agreement was signed in the presence of Prime Minister Scott Morrison, The Honorary Christopher Pyne, Minister for Defence and Florence Parly, French Minister for the Armed Forces. “Naval Group is known for building world-leading, technologically advanced submarines and has built 100 of them for nine different countries. This agreement with Australia will see Naval Group transfer the “know-how” and “know-why” to Australia to become a sovereign submarine nation,” said Hervé Guillou, Chairman and CEO, Naval Group. “We are very excited about the opportunities that lay ahead of us and are committed to delivering the Future Submarine Program for Australia. 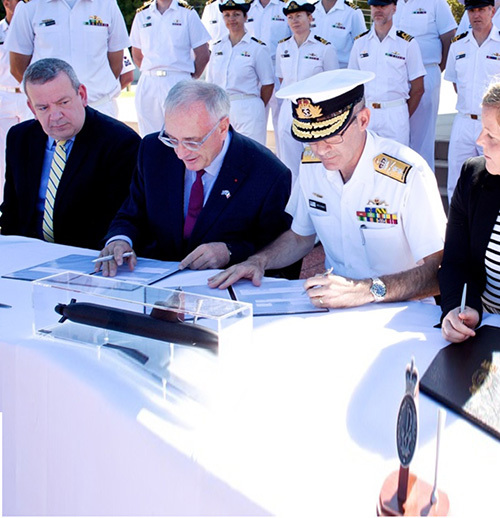 We are grateful to the teams from the Commonwealth of Australia and Naval Group who have worked hard to achieve this agreement,” added Mr. Guillou. Since being selected as Australia’s partner for the Attack class Submarine Program in April 2016, a lot has been achieved.